What do I do to prevent the menu from causing this error message? A: You should adjust your browser settings. "Allow active content from files to run on My Computer". There is no way to enable these preferences automatically, in othercase there are no reasons to create security preferences. Q: We have a problem with true type fonts. The dropdown menu in html does not showing properly for Turkish letters. We are using true type fonts (bold 10px TR Tahoma). A: Font.If there will be no TR Tahoma font on the user machinethe font won't be shown correctly. You can find another font similar to your font and write it through a comma. These fonts are installed on the most of windows computers. Or you can create images with text and use it for the top items. You can save your data file in UTF-8 in Windows version of DeluxeTuner v3.2.5. You should turn on "Tools/Use utf8 encode" property.In that case your data file will be saved in UTF-8 encode. when the rest is set to _self ? 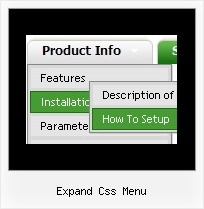 Pure css drop down menu- vertical? Using Moodle: Course Menu or YUI help ASAP! !